When you have dinner at Scampo, you will hear a lot about “her.” Her favorite is this, her preference is that. She recommends this, and she put that back on the menu. She likes to cook this medium rare, and she only serves that in half portions. She is Lydia Shire, the highly acclaimed chef and owner of Scampo (as well as Boston’s Locke-Ober and York, Maine’s Blue Sky), and she is omnipresent, which is not a bad thing. I’ve met Ms. Shire before, and she is not just an excellent chef and successful business woman, she is a gracious and modest host. I had been waiting for a special occasion to get to Scampo, one of her newer ventures, and this weekend afforded me just such an opportunity. Scampo is a lively, friendly restaurant in the Liberty Hotel. While the clientele is heavily based on the run-off from the trendy Alibi -located right across the hall- there are also families and tourists dining with you, so you’ll get a bit of everything. The hosts and waitstaff are excellent, with one minor caveat: After my sparkling water glass was filled to the brim for the third time in two minutes by our incredibly overzealous water-waiter, I began to mentally examine the concept of over-service. I certainly appreciated his tenacity toward keeping every glass as full as possible, but after his tenth refill I just wanted to tie him to a chair to keep him still. Chill out man, I hydrated before I left the house. With our water more than taken care of, we were able to focus on Scampo’s wine list, which was modern and relevant. We chose a Crocker Star Cabernet that complemented just about everything we ordered, starting with the visually arresting Onion and Cider Soup. 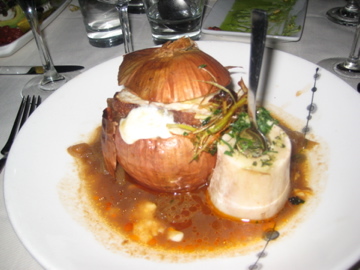 The recipient of this first course described it as “really good onion soup, but sweet, and with extras.” I mean, what else is there to say? The bone marrow and fontina were the extras, and they were much appreciated. For me however, the winner of the entire meal was my first course- sweetbreads agrodolce with muscat-plumped golden raisins and crisped risotto milanese. 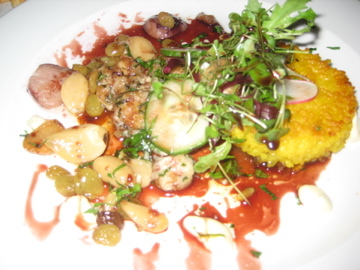 “Agrodolce” is an Italian term for sweet and sour, but the preparation was actually very mild, allowing the flavor of the sweetbreads to shine. The texture was the best part – because of course, that is the risk you take with sweetbreads- they were seared to a chewy tenderness. For main courses, the duck with mahogany glaze of espresso, anisette, and red chilies was presented far more impressively than the sub-par picture I took could convey. (So much so, I’m not even including the photo.) The bird was crusted nicely but still tender and moist. Ordered by someone who has eaten duck in some of the finest restaurants in America (I’m not referring to myself) and still given two thumbs up, this dish is clearly a star. 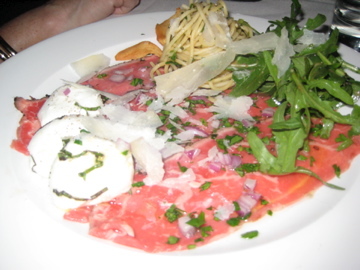 Another feature at Scampo is their “mozzarella bar,” a section of the menu highlighting different types of mozzarella accompanied by items such as crab, beef carpaccio, and sumac. Anytime I see burrata- a mozz with cream folded in- I melt a little, so I had to try it. It was definitely worth the price of admission- I could see myself stopping in after work for a drink and a few options from the mozzarella bar on a regular basis. Surprisingly, I was less enthusiastic about the pasta options at this Italian restaurant. The bolognese was good, if not particularly noteworthy. The risotto with crisped duck leg and bitter orange had a nice flavor, but was a tad watery. The best of the bunch was the spinach gnocchetti with sea-salted and roasted walnuts in a gorgonzola cream – great flavor, great texture, pungent but not overwhelming sauce. For dessert we had lemon budino cake and a surprise gift from the chef to honor our celebration, which was much appreciated. The lemon cake was topped with almond cookie crumbs and cream, making the whole thing worth it, and our server’s dessert wine recommendation paired perfectly. It’s hard not to be happy in Lydia Shire’s omnipresent shadow at Scampo. Just tell the guy pouring your water to chill out. 1) So Larry must have suggested the Crocker Star! 2) Is this the hotel that has the “trendy” bar scene? 3) Lokks like a great place- I’ll try it next trip to Boston! 3. it is great- definitely check it out! You don’t need to put 40 different flavors on the plate. I thought there was a trend to simplicity lately.